From Comicave Toys. The 1/12 Scale Midas is a 75% die-cast metal, fully articulated figurine with interchangeable accessories, and LED light features in the eyes and chest. Extendable joints throughout the figure enable extensive posability and playability. This High-Altitude Suit seen in Marvel's Iron Man 3 movie, the Mark XXI (21) features gold titanium alloy plating, and is built to withstand extreme temperatures as encountered in atmospheric environments. 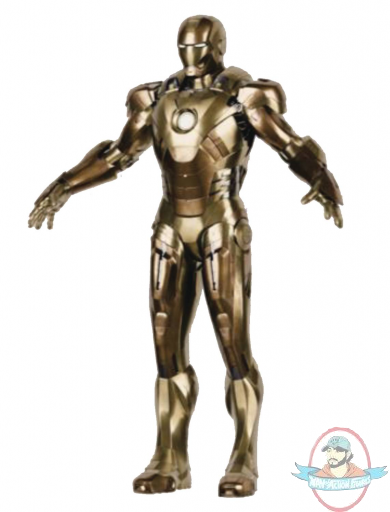 Developed based on computer 3D model from Marvel's Iron Man 3 movie, the figure features showroom quality gloss and matte metallic paints with protective coating with over 20 points of articulation!